This information is given in good faith, but no guarantee on its accuracy can be given. This summary was made as a start point for further research and it is still under construction. Finland acquired thus twenty Breguet 14 A2 aircraft in 1919 and also over two hundred (221) used Fiat A-12bis engines from French surplus stock. The first four aircraft arrived to Finland in July 1919. In 1921 ten more aircraft were bought, followed by eight next year. The planes obtained in 1921 were without engines. The type remained in Finnish service until 1927. 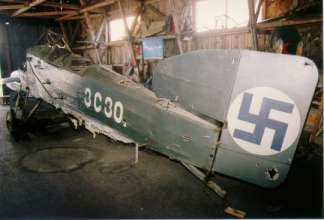 One aircraft (3C30) is still existing today at Central Finland Aviation Museum, where it is under restoration. In July 1919 one Breguet 14, flown by a Danish pilot from Paris to Stockholm and back (some sources say Finland was the goal), made a forced landing near Enköping in Sweden. The aircraft was donated to the Swedish Army and it was in use there until 1922. If this flight had something to do with the delivery of Finnish aircraft is not clear. The prototype Breguet AV 1 first flew on 21 November 1916. The first order for 150 Breguet 14 A2s was received on 6 March 1917 and the first units were equipped in August 1917. 14 A2 was the reconnaissance version, while B2 was the bomber, other versions were B1 single seated bomber, E2 trainer, S ambulance, H float plane, C2 two seated fighter and T civil passenger aircraft. A2 denotes Corps d'Armée two seater. 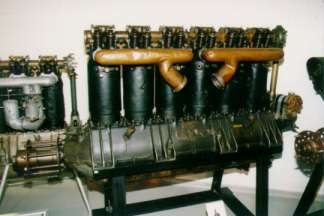 Italian Fiat engines were utilised due to the shortage of the original Renault 12F engines. 24 out of 71 French Breguet 14 escadrilles used the Fiat engined version during WW1, as well as Belgian Aviation Militaire Belge and the U.S. Air Service. All Finnish aircraft had Fiat engines. The production of Breguet 14 continued until 1926, by which time over 8000 aircraft had been built. War time orders of some 5500 aircraft were spread to several manufacturers. 14 A2 could carry four 120 mm (10 kg, also 12,5 kg bombs used in Finland) bombs, a camera and a wireless transmitter. It had dual controls for the observer. Armament consisted of one synchronised fixed Vickers machine gun for the pilot and twin TO3 ring mounted Lewis (L.M.G. in Finland?) machine guns for the observer. Machine guns and the ring mounting were not always installed in Finnish aircraft, sometimes the observer had only a single mg. Michelin bomb racks were located under the lower wing, just outboard of the inner interplane struts. A French surplus catalog  from around 1920 lists Bréguet 14-A 2 aircraft with a Renault engine at 50 000 FF and with a Fiat engine at 20 000 FF. The Fiat Type A-12 engine was listed separately at 6000 FF, whereas Renault Type 12Fcx and 12Fe were priced at 18 000 FF. Breguet 14 formed the backbone of Finnish Aviation Forces for several years. The first aircraft were assigned to the 2nd Aviation Detachment (Ilmailuosasto 2, Ilm.Os) at Utti, which was in 1921 renamed to 1st Aviation Detachment (Ilmailuosasto 1) and in 1924 to Land Reconnaissance Squadron (Maatiedustelulaivue, Ma.T.L) and finally in 1926 to Land Flying Squadron (Maalentoeskaaderi, M.L.E). In summer they were often operated from Perkjärvi, which was the only full size airfield, besides Utti, in Finland. After 1920 also the Aircraft Factory at Santahamina had a small airfield. During winters Breguets were operated all over the country on skis. 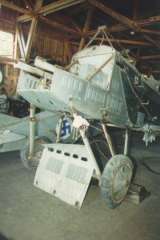 At Utti French mechanics assembled the first aircraft and French instructors taught Finnish pilots to fly the Breguets. Instructors included the Lieutenants Bourdon and Moutonnieux and Sous-Lieutenant Discours. Some aircraft were also probably assembled at Santahamina. Reconnaissance flights on the south east border were also made in 1920 and 1922 . In February 1922 a flight was made to St. Petersburg from Viipuri . In the summer of 1920 Telefunken radios were used for the first time in artillery spotting rehearsals at Perkjärvi, which were continued on yearly basis in 1920-23. An unofficial height record of 6000 m was reached on 17 May 1920 by Lieutenants E. Stenbäck (pilot) and K.W. Chanson (later Janarmo) at Utti [Aero July 1922, Ilmailu 7/1962 11/1982]. The official height record of 5900 m was reached on 6 September 1922 by Lieutenants W. Bremer (pilot) and A. Könni II (observer) at Utti [Aero Aug/Sep 1922, Ilmailu 8/1962]. With Breguets the Aviation Forces also started to fly a mail service between Helsinki and Tallinn on 12 February 1920 . The hard winter had isolated Estonia from the rest of the world, but made also flights over the sea safer. The ongoing peace negotiations with Soviet Russia increased the need for diplomatic contacts. Ten return flights were made until March 10th, when the sea was again open, by 2nd Lts Armas Anthoni, Carl-Erik Leijer and Tauno Hannelius (later Hannus) and the French Sergeant Major (Maréchal des Logis) Pierre Burello, carrying diplomatic mail and occasionally a VIP. On Mach 3rd one of the planes carrying a diplomat made a landing on Wrangler Island (Prangli?) 25 km north east of Tallinn, due to fuel shortage. The service was not continued in 1921, maybe also due to the opposition of the new Commander of Aviation Forces Major A. Somersalo [8 p.112]. At least in February 1922 mail flights were made from Santahamina in Helsinki to Lasnamäki airfield in Tallinn. The book "Finland i krig 1939-1945" has a photo on page 29 showing the Finnish foreign minister in full flying outfit standing in front of a Breguet 14. The text says "Foreign minister Holsti returning from Warsaw in 1922". It seems unlikely that he really flew from Warsaw, but was just transported from Tallinn to Helsinki. According to  a new "wing profile" was tried on the 3C30 at a later stage, but it worsened the flight characteristics so much, that the Air Force did not accept the aircraft and it was taken out of service and stored only 60 hours after a major overhaul. The last long distance flight of the aircraft, Utti-Perkjärvi-Utti, was made by Warrant Officer V. Salminen. There is a photo of the 3C30 crashed at Utti around 1925-26, with broken upper and lower right wings. Maybe only the repair or rigging was unsuccessful, not that a completely new wing design was tried. The 3C30 had the French No. N1922. The aircraft was in Vesivehmaa storage hangar until 10 May 2000, when it was moved to Central Finland Aviation Museum for restoration. The 3C30 has the original "enlarged" radiator, but the cowling has openings for separate exhaust stacks for each cylinder (see also engine installations). It also has balanced ailerons and wire trailing edges. 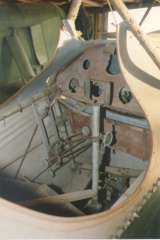 Two transparent windows on the floor of the rear cockpit were added in the end of 1925. The lower wings carry the registration BR-30, while elsewhere the older code 3C30 is used. 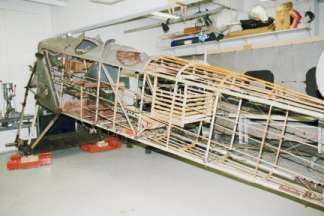 The rear part of the fuselage has been repaired with steel tubing instead of aluminium. Besides the 240 liter main tank, the aircraft also had a 130 liter jettisonible lower fuselage tank. A round fuel level indicator was located over the main tank. 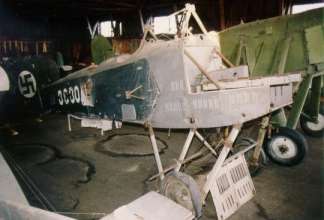 The aircraft was fitted with treadless Palmer Cord Aero Tyres of the size 800 x 150 mm. The hub had a bore of 55 mm and was 185 mm wide with 135/50 offsetted track line. The Palmer Tyre Ltd developed the wheel in 1913-14 after an inquiry by the Royal Aircraft Factory . They had a special bead and rim design to resist the lateral forces in landing. Breguet 14 A2 aircraft photographed at Vesivehmaa Storage Hangar on 4 August 1992. Breguet 14 A2 aircraft photographed at Vesivehmaa Storage Hangar on 31 July 1993. Breguet 14 A2 cockpit photographed at Vesivehmaa Storage Hangar on 4 August 1992. Breguet 14 A2 upper wing tip photographed at Vesivehmaa Storage Hangar on 4 August 1992. Breguet 14 A2 radiator photographed at Vesivehmaa Storage Hangar on 4 August 1992. The aircraft first carried the registrations 2C.460-471, 476, 477, 481-485 and 2A.491, 492, 495 (22 aircraft). On 27 October 1921 the letter C was officially changed to B. Where 2 is the number of seats, A denotes trainer, B reconnaissance aircraft, C biplane combat aircraft and the first 4 means of French origin. In the beginning of the year 1922 the registrations were changed to 3A.1-9, 3C.21-30 (19 aircraft), for instance 2B.467 was later 3A.1. and 2B.469 became 3A.2. Where 3 denotes reconnaissance aircraft, while the letter is a code for the year when acquired, A = 1919, C = 1921. After 1 June 1927 the remaining aircraft were allocated the registrations BR-2, 8, 21-23, 25, 29, 30 (8 aircraft, 1-30 reserved), but these were never applied to actual aircraft. There is a mismatch between the number of registrations (22/19) and the number of aircraft acquired (38). This has been explained by the fact that a hangar at Perkjärvi was destroyed by a fire in July 1920, destroying four unnumbered aircraft, which were written off in 1923 and that the eight acquired in 1922 were partly used as spares. Also the engine installation for the batch of 1921 may have delayed them being operational. The registrations given in 1922 indicate that only 9 aircraft of the original 20 acquired in 1919, were left at that time. No registrations, with the letter D, were given for the batch acquired in 1922. Already on 25 October 1920 the number of serviceable Breguet 14 aircraft was 9 [8 p.74]. 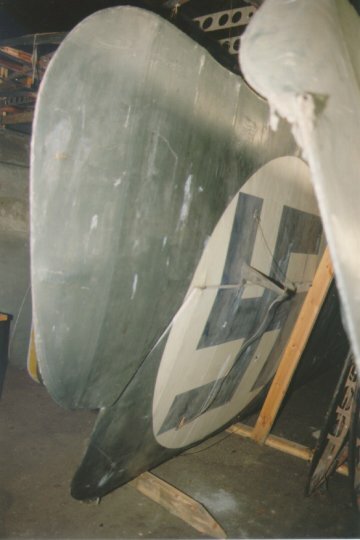 Finnish national insignia were painted over the original French roundels and the original French colors and lettering on the rudder was first over painted with white. 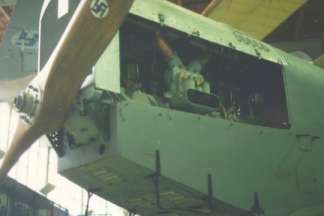 Some aircraft had the text "PHOTO", indicating that they had a rack for a vertical camera. The surviving 3C30 has the latter camouflage. The diameter of the national insignia on the tail is 850 mm and on the upper and lower wings 1700 mm. The letters of the white text "3C30." are approximately 400 mm high, 240 mm wide and the weight of each letter is 60 mm. These vary fairly much between each letter. A black text "TUKI" (support) is located where the French aircraft had the text "LEVEZ ICI" and it is 60 mm high. There is also a small text "ÖLJYÄ" (oil) in front of the rudder post. This aircraft also had the letters BR- under the right wing and the serial 30 under the left wing. These letters were 1075 mm high, 705 mm wide, with 175 mm thickness. Good sources for personal markings are  and . Louis Bréguet was a pioneer of all-metal construction. 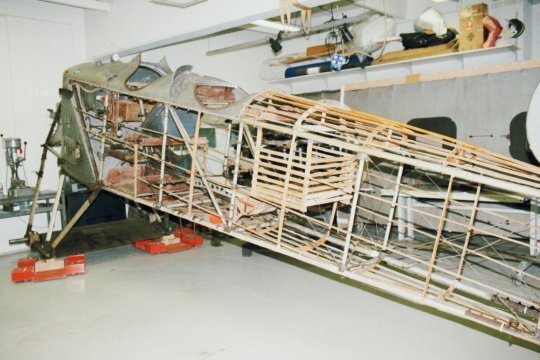 The fuselage of Breguet 14 has round aluminium tube longerons and spacers, that are connected with welded steel tube nodes and braced with diagonal wires. The rear cockpit area is reinforced with diagonal aluminium struts and the area ahead of the front cockpit with diagonal steel tubes. The rudder post is a length of round steel tube. The engine mount consists of a pair of longitudinal aluminium C-channel bearers, connected with aluminium cross members and supported by diagonal steel struts. Landing gear struts are of streamlined aluminium tubing, reinforced with a steel C-channel. Later 14 A2 production machines were fitted with aerodynamic balanced ailerons and enlarged span for the lower wing. Some aircraft had wings with a wire trailing edge, this was employed with both type of ailerons. Early aircraft had a rudder with a straight lower edge, while on later aircraft it followed the lower line of the fuselage. Interestingly the 14 B2 bomber version had spring loaded flaps on lower wings, which lowered automatically as the air speed dropped, they were abandoned with the introduction of balanced ailerons. * 50,4 m² better estimation? Finland had some aircraft with balanced ailerons. At least 3C21, and 3C30, that were also tried with floats, had them and maybe also 3A6. There are more photos of aircraft with balanced ailerons, but the serial numbers are unrecognizable. Maybe the second batch of aircraft, that came in 1921, had balanced ailerons. All Finnish aircraft seem to have wire trailing edges. Finnish Breguets had skids under lower wing tips, which were typical for training aircraft. They also had a wind shield (deflector) in front of the rear cockpit, on the left side, intended to ease the use of a camera. 240 liters of fuel was carried in the upper tank in front of the pilot. Additional 130 liters was carried in the lower jettisonible tank, that was located in the fuselage between front landing gear strut attachment points. The weight of fuel in handbook doesn´t match the capacity. The Fiat A-12bis engine developed 300 hp at 1700 r/min out of 6-cylinders and 21,7 liters of displacement. The dry weight of the engine was 418 kg. Fuel consumption at full throttle was 92,5 l/h. A total of 13 000 were built. The A-12bis was prone to catch fire in flight, carburettor fires destroyed several Breguets also in Finland, especially after starts in cold climate conditions. For example the 3A5 was destroyed after a carburettor fire in flight in April 1922. Most of the Finnish Breguet 14 aircraft had originally the standard French Fiat A-12bis engine installation, characterized by the enlarged radiator. They had a round air intake on the left side and an all-in-one exhaust gas collector to the right. Also the cylinder head was visible. Only two aircraft had new engines, 3A5 being one of them. Finland had also license built modified Hansa-Brandenburg W.33 aircraft (called I.V.L. A.22 Hansa in Finland), that had the same Fiat engine as the Breguet 14. The first few of these aircraft, built in Finland by Ilmailuvoimien lentokonetehdas (Aircraft Factory of Aviation Forces) I.V.L., had two melon shaped under slung French Lamblin radiators and a rounded nose. They had similar exhaust stack and propeller as the original Breguet. The first Hansa with this radiator installation was produced on 15 October 1922. A limited number of Breguet 14 aircraft were converted with two Lamblin radiators between the front struts of the landing gear. At least the 3A1 had Lamblin radiators with rounded nose and a round air intake. 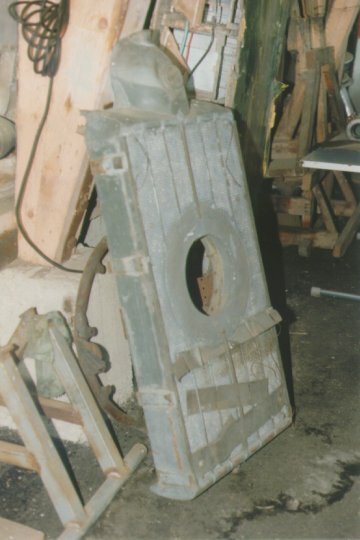 One photo shows a fairly crude conversion of the original cowling. The lack of photos and the cooling trouble experienced with the I.V.L. A.22 Hansa aircraft indicate that only few were made. Because of cooling problems with Lamblin radiators, a new radiator for the I.V.L. A.22 Hansa was designed in 1923 by John Jäderholm. 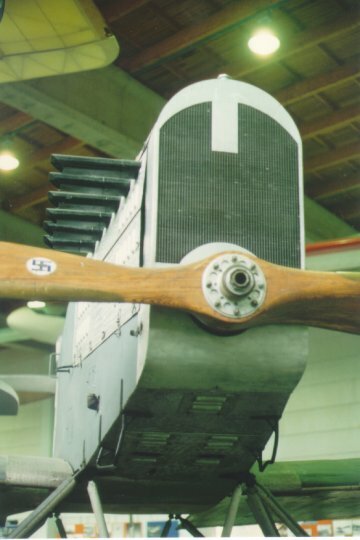 A number of Breguet 14 aircraft had also these radiators. The radiator was located in the nose, over the propeller shaft and the engine was completely enclosed. The air intake was oval, race track shaped and the exhaust stacks were separate for each cylinder. The cowling had sharper corners than the Lamblin conversion. Oval air intake could mean that the French serial aircraft were fitted with other carburettor than the standard Fiat unit. The ten aircraft acquired in 1921 were without engines and it would seem logical that some of these were fitted with early or later type Hansa radiators. The 3A1 with Lamblin radiators was, however, of the earlier batch and maybe rebuilt in 1922 (this type of marking came in 1922). This was maybe due to lack, unavailability or price of spares or just to get work for the aircraft factory. As mentioned earlier, two different exhaust stacks were used. The original that collects all cylinders into one under the cowling and the type used with the Hansa with short stubs for each cylinder. However, Hansa type exhaust stacks were also used in connection with original radiators and original exhaust stacks also with Hansa type radiators. Besides the original propeller, also Finnish propellers designed in 1923 for the I.V.L. A.22 Hansa, with the same Fiat engine, were used. They had sharper tips than the original propeller. What looks like a national marking on the propeller is actually the trade mark of the Aircraft Factory of Aviation Forces, it carries the letters I.V.L. in the middle. The first I.V.L. Hansa produced on 15 October 1922 still had a propeller much like that used in Breguet 14. A new propeller was designed by Kurt Wolmar Berger, who was hired on 1 August 1923. He had studied aeronautics in the University of London until 1922 and he was the chief designer of I.V.L. 1924-33. The new propeller improved the speed of the Hansa by 6 km/h. The diameter of the I.V.L. propeller was 2760 mm. The diameter of the hub is 250 mm and the thickness at the hub is 160 mm. It consists of eight alternating laminations (20 mm each) of birch and ash. The original Ratier série 42bis had a diameter of 2850 mm. Original Ratier propeller of Breguet 14 A2, photographed at Finnish Aviation Museum. Propeller of I.V.L. A.22 Hansa, serial number 170, photographed at Finnish Aviation Museum. Trade mark of Aircraft Factory of Finnish Aviation Forces (I.V.L.) as used on propellers, its diameter was 100 mm and it was located 645 mm from center of propeller. Finland had two aircraft fitted with French floats, that had one central main float and small auxiliary floats at wing tips and in the rear. Similar aircraft in France were given the designation 14 H. Two are known having served in French Indochina in 1925. The floats used in Finland are very similar to the French installation, but in Finland the outer floats were located at the outer interplane struts and their angle of incidence was also smaller. Also Sweden had one 14 T ambulance on floats. At least three different ski types were used. The first ski type had attachment brackets welded out of five round steel tube struts, which were also wire braced. The first ski version had a round nose and rear end and both ends had upwards curvature. This ski had a square, tapered piece of lumber as longitudinal reinforcement in the center line. The steel struts were attached to four wooden blocks, which were as high as the reinforcement in the center. Full length bungee cord springs were used with the ski in front, this was secured by a wire that was loosely wound around the cord. The spring was attached at the very nose of the ski. On occasions the length of the spring was only 1/2-2/3 of the full length. The rear tip of the ski was suspended by a constant length wire without springs. 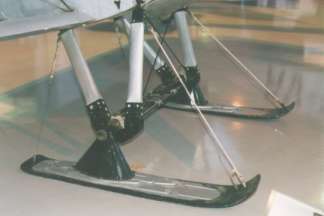 The second ski type had similar attachment brackets as the first one, but sometimes the middle strut was missing. This version had a tapered blunt nose and the nose was only very slightly bent up. This type of ski was used, for instance, in the long distance flight competition in April 1922, two propeller were reported damaged during the competition due to the inflexibility of the ski. The third ski type is best recognized by the enclosed attachment bracket, which is a complicated welded steel sheet construction and it is bolted through the ski. 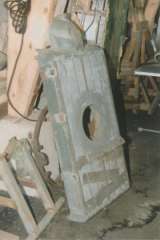 The ski was made of separate blanks of pine wood and the underside was clad with sheet metal, which was bent over the edges. This ski also had a tapered blunt nose. These skis were later manufactured also by the Aircraft Factory of Karhumäki Brothers and they remained the standard ski of the Finnish Air Force for decades. They were used almost unchanged at least until the late fifties, for instance with the Fw 44 Stieglitz. There is a photo of 3A2 taken on 25 March 1927 with this third type of skis. They seem to be fairly common, most likely they were introduced earlier than 1927, the year the aircraft were removed from service. 3A2 had (in 1927) 2/3 length springs in front and double wires (loop) in the rear part of the ski. The spring was attached at the point where the upward curvature starts. The third ski type was similar to this one, photographed at Central Finland Aviation Museum, but larger for Breguet 14 aircraft Tail skis were attached to the wooden part of the normal tail skid, so that the leaf spring hits the ground (snow, ice) first. The nose of the tail ski was rounded or pointed. This article hosted by permission. All protographs by Seppo Koivisto (C) 1992-2002. Seppo Koivisto's Aviation History web page. Janarmo K.W., Breguet 14 A2, Ilmailu, No. 5, 1966, p. 20. Keskinen K. et al, Suomen ilmavoimien lentokoneet 1918-38 (Aircraft of the Finnish Air Force 1918-38), Tietoteos, 1976, p. 39-45. Keskinen K., Stenman K., Suomen ilmavoimien lentokoneet 1918-1993 (Aircraft of the Finnish Air Force 1918-1993), AR-kustannus, 1992, p. 22, 23. Heinonen T., Thulinista Hornetiin, Keski-Suomen Ilmailumuseo, 1992, p. 44-46. Keskinen K. et al, Finnish Air Force Camouflage and Markings, Apali, 1996, p. 8-11, 141, 166. Bruce J.M., Noel J., The Breguet 14, Profile Publications, No. 157, 1967, 16 p.
Uola M., Suomen ilmavoimat (Finnish Air Force), Karisto, 1975, p. 51, 74, 77, 107, 111, 116. Larjo L., Taitolento ja sen historia, Otava, 1947, p. 52. Vesivehmaan museokoneet, Suomen Siivet, No. 3, 1969, p. 14. Keskinen K. et al, Suomen museolentokoneet (Finnish museum aircraft), Tietoteos, 1981, p. 9. Mattelmäki U.A., Ilmailuvoimien ja lentokonetehtaan alkuaikojen historiasta, Lentoratas, No. 2, 1986, p. 4-6. Van Wyngarden G., Toelle A.D, Colors: American Breguet 14s, Over the Front, Vol. 2, No. 2, 1987, p. 186-189, Vol. 3, No. 4, 1988, p. 360-373. Van Wyngarden G., Colors: The Breguet 14A.2 and 14B.2, Over the Front, Vol. 11, No. 3, 1996, p. 260-272. Stenman K., Muikku E., Ilmavoimiemme tunnukset, Ilmailu, No. 6-7, 1984, p. 36-37. Smith H., A History of Aircraft Piston Engines, Sunflower University Press, 1986, p. 39, 40, 41, 54. Tervasmaa A., Isän kelkan perässä, Feeniks, No. 2, 1997, p. 16-18. Wegg J., Finnair - the art of flying since 1923, Finnair, 1983, p. 14. Woodman H., Early Aircraft Armament, Arms & Armour Press, 1989, p. 82, 86. Janarmo K.W., Arvo Tervasmaa, suomalaisten lentokonesuksien ja moottorikelkkojen ansiokas kehittäjä, Ilmailu, No. 2, 1963, p. 12-13. Janarmo K.W., Katsaus ilmavoimiemme alkuaikojen kalustohankintoihin, Ilmailu, No. 5, 1964, p. 12-14. Janarmo K.W., Frenckell vastaan Törnudd eli aika ennen Aero-yhtiötä, Ilmailu, No. 4, 1964, p. 16-17. Lüning Ö., Luftpostens historia i Norden (The History of Airmail in Scandinavia), Sveriges Filatelist-Förbund, 1978, p. 61-63, 238, 335. Ritaranta E., Suomalainen taitolento 75 vuotta - Gunnar Holmqvistin lentäjänura, Suomen Ilmailuhistoriallinen Lehti, No. 2, 1994, p. 10-12. Lentomestari Eino Juurikas - Muisteluita ja muistiinpanoja, Lentovarikon Kilta ry., 1995, 98 p.
Alajoki M., Tykistönkenraali Vilho Petter Nenonen, Otava, 1975, p. 141, 150-151, 168, 187, 204. Alakulppi J., Lapin ilmailuhistoria I, Lapin maakuntamuseon julkaisuja 9, 1999, p. 40-43, 45-54. 3 C 25:llä Petsamoon, Aero, No. 4-5, 1922, p. 85-89. Hannus T., Utin lentoaseman alkuvaiheet vuosina 1918-1919, 1936, I+25+7 p.
Pakarinen J., Rajalainen J., Satakunnan lennoston historia 1918-1998, 1998, p. 41-42. Woodman H., The Breguet 14Bs, Scale Aviation Modeller International, Vol. 6, No. 6, June 2000, p. 472-478. Haapanen A., Suomalaiset pommikoneet sodan taivaalla, Apali, 2000, p. 18-21.